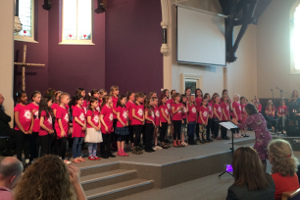 A great choir for girls and boys aged 7 – 13 who want to sing a wide variety of music in a fun and relaxed environment! The sessions are led by experienced choir leaders and the group rehearse Tuesday evenings during term-time. Pop and folk, classical songs and favourites from musicals – we perform all of them to our friends and families in our regular concerts across Nottinghamshire. Members are enthusiastic singers – No auditions! ‘It helps me to read music and get more confident at singing’.